Fifteen years after its creation, the Homeland Security Department still lacks a unity of effort among components that enforce immigration law, a watchdog found. “Without a more unified approach to immigration that includes efficiency in management of resources, DHS will continue to allow vulnerabilities that may affect national security and public safety to persist,” said a report released last week by Inspector General John Roth. The culprits: weak intra-agency coordination and communication on schedules, resources, and status of aliens and asylum seekers in the agencies’ systems. The audit focused primarily on Customs and Border Protection, Immigration and Customs Enforcement, and U.S. Citizenship and Immigration Services found that DHS had made progress in implementing the “Unity of Effort” initiative implemented in 2014 by then-Secretary Jeh Johnson to break up silos and centralize decision making. But the immigration enforcement functions of the 229,000-employee department created through mergers after the 9/11 terrorist attacks remain a work in progress. This is a continuing concern among members of Congress who perform complicated oversight of what used to be 22 separate agencies. DHS between 2014 and 2016 had a budget of $22.8 billion to enforce and administer immigration laws, 95 percent of which was spent by ICE, CBP and USCIS. Another example of weak coordination involves work schedules and bed space availability for detainees. 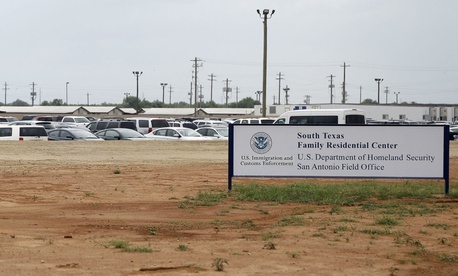 “CBP is a 24-hour, 7-day-a-week operation, but ICE Enforcement and Removal normally does not work night or weekend shifts for processing aliens,” the audit noted. ICE “may not have the staff available to process aliens during certain times.” CBP in one instance reported that it tried to contact ICE to seek bed space, but could not reach employees during the weekend. To improve unity among immigration-related components, the auditors recommended that DHS establish a formal department-level group to facilitate long-term solutions for overarching component immigration enforcement and administration challenges, as well as improve efficiencies. Members of such a group would also “serve as mediators for conflicts regarding mission accomplishment and overarching legal, policy, and other issues,” auditors wrote. DHS agreed with the draft recommendation. James Nealon, assistant secretary for international affairs, strategy, policy and plans, wrote to the IG saying, “The Office of Strategy, Policy and Plans will seek to charter a senior-level cross-component Immigration Policy Council” to implement the recommendation.